Though he only finished runner up in this year’s WSOP Main Event, Martin Staszko did just win something: a PokerStars Pro sponsorship deal! Read all about it here on the Cardplayer Lifestyle poker blog. 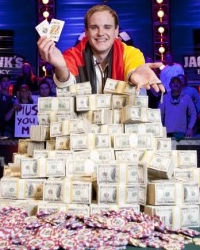 Today a new World Series of Poker Main Event Champion was crowned: 22-year-old Pius Heinz, of Cologne, Germany. The Cardplayer Lifestyle poker blog brings you the highlights of 3-handed play at the final table, and a summary of how he defeated WSOP Player of the Year Ben Lamb and his heads-up opponent, Martin Staszko of the Czech Republic. Out of a field of over 6,500, only 3 poker players now remain. Ben Lamb, Martin Staszko, and Pius Heinz will battle it out tomorrow to crown a World Series of Poker Main Event Champion.